As you can see, the iPhone still bests just about everything in screen resolution, but falls far behind in the screen’s physical size. That isn’t an important factor for some, but it’s a big deal for others. The iPhone 4S’ processor is well in line with the rest, but we don’t have numbers on certain specs like RAM and battery capacity, so a hard line comparison is difficult. The iPhone’s radio brings it up to speed with “4G” phones, but only on AT&T. While the iPhone’s most expensive model has a jaw-dropping 64GB of storage, Apple once again eschewed any sort of removable memory. Of course, this chart only includes currently-selling phones. 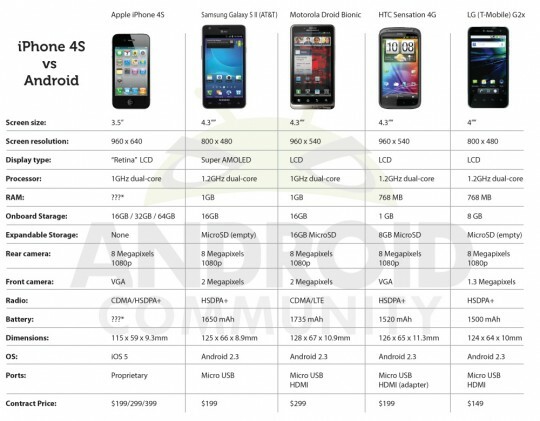 New competitiors like the Samsung Galaxy S II HD and Galaxy Note best the iPhone as far as the screen goes, and who knows what goodies are lying inside the DROID RAZR or Nexus Prime. We’ll have to wait a few weeks for details on the latest and greatest in the Android world – for new smartphone hardware from Apple, be sure to tune in in about 12 months or so.